70s spiritual soul jazz lives again – in this righteous tribute to the late John Coltrane! The incredible collection is filled with wonderful tracks both classic and current – and is a great bridge between the first waves of this kind of music at the end of the 60s, and the contemporary revival that's been going on at a global level! 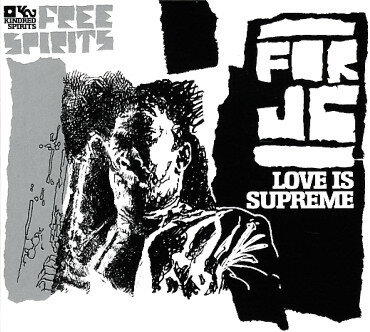 Perhaps the best thing here is the way that there's no apparent difference in sound or style between the old and new cuts – and the folks at Free Spirits have really found a way to make the whole thing flow together wonderfully by selecting music that's deeply soulful, extremely positive, and filled with soaring vocals and instrumental solos! Titles include "Mode For Trane" by Billy Gault, "Naima" by Mark De Clive-Lowe, "A Love Supreme" by Rufus Harley, "John Coltrane's A Love Supreme" by Karin Krog & Nils Lindberg, "Duke & Trane" by Haikki Samarto Ensemble, "John Coltrane" by Our Cry For Peace (Dwight Trible/Build An Ark), "Prince Of Peace" by Pharoah Sanders, "Liberation Of The Spirit" by Kamau Daaood, "Naima" by 4 Hero, and "A Love Supreme" by Dwight Trible. © 1996-2019, Dusty Groove, Inc.